I interrupt my usual stream of non-blogging for this general "off topic" post. 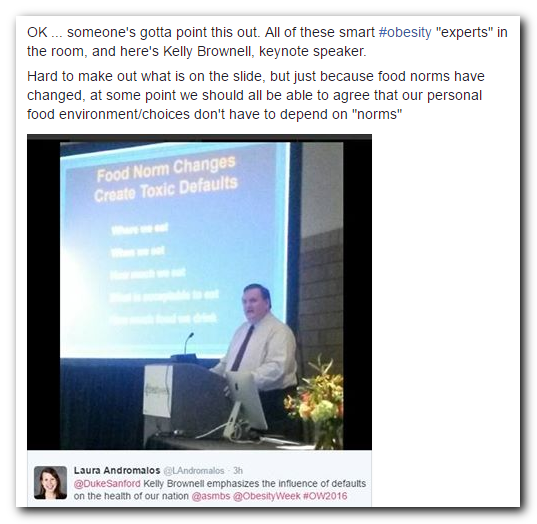 Last week, the smartest people in the room (or so I'm told by friends who attended) on the topic, convened in New Orleans to tackle obesity. 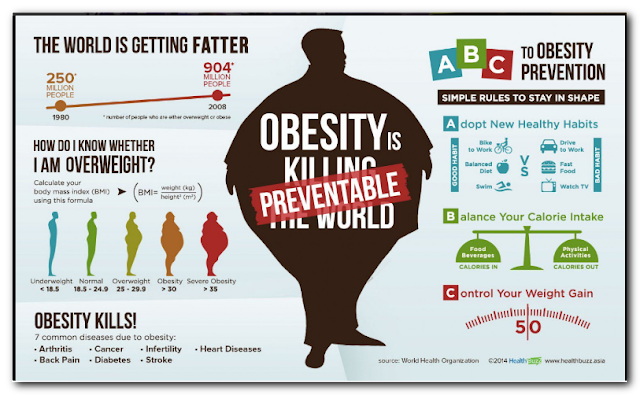 Obesity Week -- "where science and treatment meet" -- is a conference and marketing expo put on jointly by The Obesity Society (TOS, who publish Obesity peer-review journal) and the American Society for Metabolic & Bariatric Surgery (ASMBS). If my social media feed and following the #OW2016 feed on Twitter are any indication, it's mostly a place where the experts go to pat one another on the back and socialize -- there seem to be a lot of awards handed out at this thing! Still, I'm told that the talks are great and really that I should ignore all the marketing for weight loss surgery, drugs, and associated products. It seems that several medical organizations have joined the AMA in over-ruling its own science committee and made a "just so" statement that obesity is a disease. Not just a disease, but a lifelong chronic one, from which I'm told there is no cure -- only remission. The degree to which this is infuriating cannot be overstated. Make no mistake about it, this is a huge power grab at the money pie that is this "war on obesity". If folks want to talk about how the playbook of the tobacco industry is being followed by the sugar industry, then so, too, we need to talk about how the public-manipulation-politics-playbook is being followed with regard to obesity. We have a *crisis* and "it's going to bankrupt us if we don't do something". Then we spend more on every which program, foundation and study that has "obesity is a pressing public issue" somewhere in the writings. This has some overlap with other topics I've been and will continue to blog on, so I'll leave this for now as background. 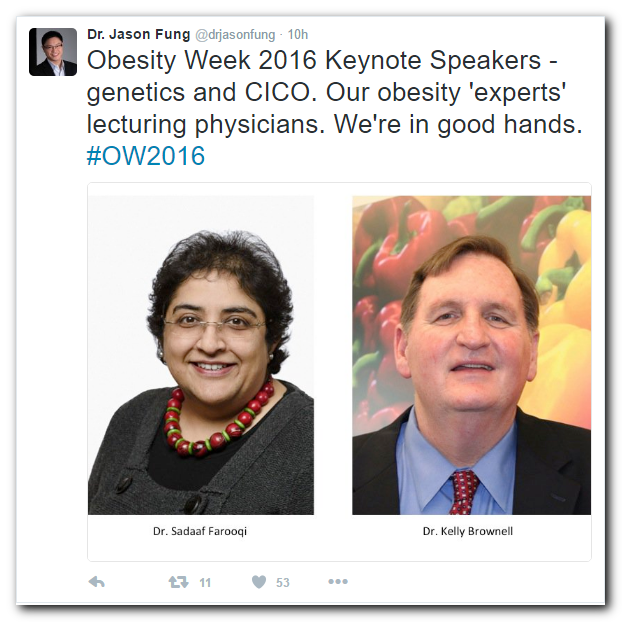 Obesity Week has keynote speakers, and this year Drs. Sadaaf Farooqi and Kelly Brownell were chosen. A fan favorite of Asylum contributors (grin), Dr. Jason Fung, got himself in a little hot water with the above tweet, that I'll copy here. Dr. Yoni Freedhoff of Weighty Matters blog, responded with an eleven part tweet. These are nicely collected here. Freedhoff accused Fung of fat shaming. There have been tweets in support of Fung in response to the accusation, and I'm in the uncomfortable position of agreeing with them *in part*. Firstly, it is possible that he truly believes obesity is not genetics and that CICO is a failed hypothesis. Sigh on that front. We absolutely need to separate out the very small percentages of genetic/endogenous obesity from the "simple"/exogenous obesity of the current epidemic. Americans (and other industrialized nations) eat more, and probably move less than we did in 1970. FACT. Back to Brownell and Farooqi. If indeed Fung was intending to bring the speakers' weights into the discussion, that would indeed *potentially* be fat shaming. However, even there, can we please have some nuance in the discussion? The term is already over-used and it's only going to get worse if people fly off the handle at every perceived instance. It's like every time a white cop mistreats a black person the motivation *has* to be racism. It can't be that the white cop ever just reacted badly, or doesn't possess the personal makeup to be in that position at all. It must be only racism. So there's that. Not all mentions of a person's weight are fat shaming and just like other terms, overuse will dilute the meaning of real incidents of serious magnitude. 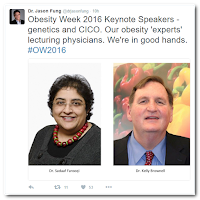 If Fung intended to imply that Dr. Farooqi should not be speaking on the genetic causes/links to obesity because she is overweight, and I believe he did, that is unequivocally fat shaming. She is a PhD researcher who "identified the first single gene defect to cause human obesity in patients with a mutation in the leptin gene, published in Nature in 1997 and described their dramatic response to leptin therapy (NEJM 1999; SCIENCE 2007)". Her weight is IRRELEVANT. In her case, the charge of fat shaming is being used correctly as seeking to discredit her because she carries a few extra pounds. Of course members of diet cults are famous for this sort of behavior and justify it amongst themselves. I've C&P'd his entire bio from the OW2016 website. Bold emphases are mine. Kelly Brownell, PhD, is Dean of the Sanford School of Public Policy at Duke University, where he is also Robert L. Flowers Professor of Public Policy and Professor of Psychology and Neuroscience. In 2006 Time magazine listed Kelly Brownell among “The World’s 100 Most Influential People” in its special Time 100 issue featuring those “.. whose power, talent or moral example is transforming the world.” Brownell was elected to membership in the National Academy of Medicine (formerly the Institute of Medicine) in 2006 and has received numerous awards and honors for his work, including the Lifetime Achievement Award from the American Psychological Association, Graduate Mentoring Award from Yale, the James McKeen Cattell Award from the New York Academy of Sciences, the Distinguished Alumni Award from Purdue University, the Lifetime Achievement Award from Rutgers University, and the Distinguished Scientific Award for the Applications of Psychology from the American Psychological Association. Prior to joining the faculty at Duke, Brownell was at Yale University where he was the James Rowland Angell Professor of Psychology, Professor of Epidemiology and Public Health, and Director of the Rudd Center for Food Policy and Obesity. While at Yale he served as Chair of the Department of Psychology and as Master of Silliman College. Dr. Brownell has published 15 books and more than 350 scientific articles and chapters. He has served as President of several national organizations, including the Society of Behavioral Medicine, Association for the Advancement of Behavior Therapy, and the Division of Health Psychology of the American Psychological Association. Dr. Brownell has advised the White House, members of congress, governors, world health and nutrition organizations, and media leaders on issues of nutrition, obesity, and public policy. He was cited as a “moral entrepreneur” with special influence on public discourse in a history of the obesity field and was cited by Time magazine as a leading “warrior” in the area of nutrition and public policy. YES. I believe Kelly Brownell's obesity is a relevant issue. So if Brownell hasn't tried to treat or manage -- or whatever the feel-right term is these days -- his own obesity the question is "Why not?" About a third of the tweets from talks seemed to be involved with actually treating obesity -- e.g. weight loss and maintenance. Have any of these experts ever approached Brownell to help him?? But more importantly, several talks involved public health policy to address the epidemic. This is not treating the individual, this is manipulating the population. There was discussion of portion control regulations and taxation to curtail consumption of certain foods. There was talk about socio-economic status (the very fact that an affliction of affluence is now more prevalent amongst the poor is also powerful evidence against disease). This IS Brownell's work. So Brownell blames the food industry and the obesogenic environment for his obesity which doesn't really sound a lot like a disease when you frame it that way now does it?! More importantly, if a man of his means, education and years can't alter his own food environment successfully, what chance in heck does anyone else have of doing so? Is he not insanely biased by his personal situation, and does it not impact the advice he gives to policy makers???? So yours truly got herself in a little bit of a spat on Twitter when I said that there is a valid point to be made about Kelly Brownell. You cannot say that someone's weight is irrelevant when they are keynoting an obesity conference and have been influential in policy making for decades now. As our healthcare system goes more and more in the direction it is going, having a disease diagnosis -- if you have no metabolic issues you are Stage 0 folks -- is going to have serious implications for many. It seems that if an obese person catches the flu, it's because they are obese. The medical establishment is resorting to signing pledges as a way to browbeat their colleagues into being properly "sensitive" to the plight of obese people -- erm ... we're supposed to say people with obesity. The medical industry is *marketing* to the obese population and they have a captive audience that requires some use of the healthcare system at some point. These are all quotes from research papers authored by Kelly Brownell. I think the onus is on those defending him to explain why his weight is not relevant to the point at hand. He wants to saddle me with a disease label, and if I drank soda he wants to tax it (I don't drink it so it won't impact me directly). I think his personal situation definitely impacts his professional work, how can it not? He's not researching metabolic pathways and genetic linkages, he's involved in the sociological side of it all. Brownell is also one of the developers of the Yale Food Addiction Scale seeking to blame food addiction for the obesity epidemic. Are we going to have trillion dollar lawsuits like with cigarettes? Of course Brownell should be treated respectfully as a fellow human being. Everyone deserves that. He really is a poor choice as a keynote speaker at an obesity conference, however, and I question his level of influence. I'm not defending Dr. Fung. He is the true epitome of everything wrong about "diet doctors". I believe he intended to discredit both keynotes based on their weights. I stand by my contention that he has a valid point in the case of Kelly Brownell.